A man who allegedly made threats about “lynching” a California judge and once served as a bodyguard for Nevada rancher Cliven Bundy was arrested by an FBI Joint Terrorism Task Force. The arrest Sunday near Seattle of Schuyler Pyatte Barbeau on a federal firearms felony charge is causing a stir on Facebook among so-called Patriot and militia groups and members. One antigovernment activist published a “Call to Action." Following Barbeau’s arrest, federal agents reportedly searched an animal-rescue ranch near Springdale, in eastern Washington, where he had been living. Militia postings on Facebook claimed that federal agents were searching for explosives but found none. The FBI will not confirm nor comment on the search at a ranch owned by Allen Aenk, who has made Facebook postings indicating he is a leader of “Sheepdog” militia. Aenk reportedly was traveling with Barbeau when agents stopped the pair while they were driving near Auburn, south of Seattle. Aenk was detained briefly, but was released and hasn’t been charged. When reached by telephone today at his eastern Washington ranch, Aenk refused comment. “I’m not making any comment over the phone,” he said. 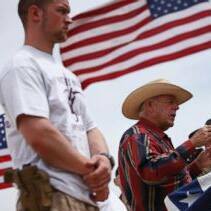 Barbeau’s Facebook page includes a photo of him armed with a sidearm acting as a bodyguard for Nevada rancher Cliven Bundy. In 2014, after decades of refusing to pay federal grazing fees, Bundy's ranch in southeastern Nevada became the site of a standoff between law enforcement and Bundy's supporters, many of whom were heavily armed. The standoff became a rallying-cry for assorted militia, Patriots, and extremists. While some of the armed Bundy supporters pointed firearms at federal law enforcement agents no arrests have been made as a result of the standoff. One Bundy supporter, Will Michael, 24, who lives in Pennsylvania, pleaded guilty in April to threatening a federal law enforcement official as well as making interstate communication threats. Now, the arrest of Barbeau, who claims to be an ex-Marine, appears to be setting off alarms in the militia and Patriot online community. Blaine Cooper, who has claimed that he is affiliated with a border militia group called “Arizona Border Recon,” made several posts today about the arrest of his friend and associate. Barbeau is charged with illegal possession of an AR-15 semi-automatic 5.56mm caliber assault rifle with a 10.5-inch barrel and a sight. Court documents say Barbeau posted at least three Facebook photos of himself with the weapon which he was attempting to sell for $5,000. Barbeau is alleged to have said that he wanted to use the money from the sale to purchase a rifle capable of firing 7.62 millimeter rounds, the type of ammunition used in Soviet-style AK47 rifles. “Barbeau believed this type of rifle would be more effective in shoot-outs with law enforcement,” court documents say. Barbeau claimed it “was his duty to educate public servants who were not living up to their oath and discussed ‘lynching’ those he deemed unworthy if necessary,” the court documents say. On Oct. 19, Barbeau invited the informant to a trailer he was occupying in Springdale, apparently on Aenk’s property, to discuss selling the short-barrel semiautomatic assault rifle. The informant, acting as a middle-man, took photos of the short-barrel weapon which Barbeau said he would sell, along with a longer barrel, optics, and other accessories, for $5,000, the court documents say. On Nov. 20, Barbeau contacted the informant via a private Facebook message and asked him to tell the buyer he was ready to sell his rifle as soon as possible. The informant told Barbeau the buyer was out of town for the Thanksgiving holiday, but offered to keep the rifle until the buyer returned to his home in western Washington. After Barbeau left the home, FBI agents arrived and took possession of the firearms subsequently determined not to be legally registered and in violation of federal law.